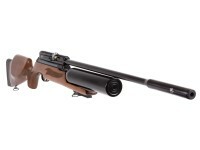 The Hatsan Nova QE air rifle is an exceptional choice for hunting and target practice. The handsome Turkish walnut stock is ergonomically designed for comfort and ease of use. If you haven't experienced the Hatsan QE technology, you'll be surprised at how quiet this gun is. The fully shrouded barrel and integrated QE sound moderator deliver 32% less shot noise. The Nova is rich with practical features like the additional Picatinny rail, anti-double pellet feed and 2-stage adjustable Quattro trigger. You'll love the look of the gold-plated trigger! 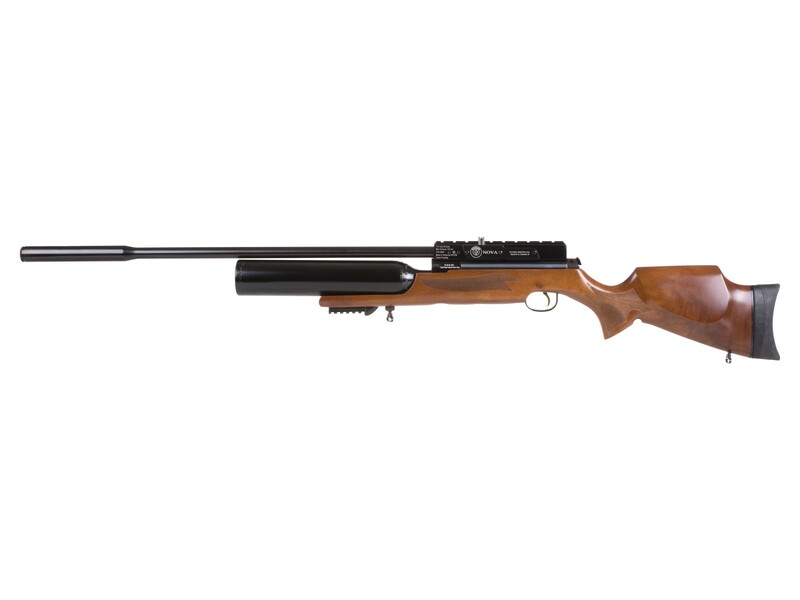 This gun delivers all the accuracy, power and speed you've come to expect from Hatsan. Things I liked: Shot counts are high. Consistency of shots have small verification. Very accurate with the right ammo. Seems to like h@n 21.14g with 5.53 head size. Still has 900+fps with these. What others should know: If you want to shoot more and fill less then you should get one of these. Things I liked: my Nova .22 easily does quarter-sized 10-shot groups @ 50 yards and ~860 fps on max power with JSB [REDESIGNED] 25.39 grain pellets. me laying on a pillow. You get more than 80 full-power shots on a tank. I hear a nice thwack or smack or pop on impact. I was really surprised how quiet it is with the QE barrel shroud. I can shoot in backyard without bothering anyone. Things I liked: Nova .25-Power, accuracy with Air Arms 25.4 gr, shooting sub-moa groups ranging from 1/2-3/4 inch groups at 100 yards depending on weather and humidity. Sub-moa groups at 25,50 and 75 yards as well. At 100 yards the pellet hits cleanly and can hear it's definite impact. Things I would have changed: Ease of getting at the barrel shroud to remove for tuning and cleaning the barrel without guessing to unscrew the shroud barrel nut. Understand why it is there, but Hatsan should come up with something better...afterall, how many years have they been doing this. What others should know: This is the second gun and haved owneds gun for over one year now and have had initial factory control problems. 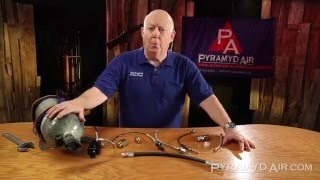 The first one Pyramid Air took back due to leak. The second I sent back to the service center for repair at no cost except for shipping for the same leak problem. Once it came back it worked well. I then began to tune the rifle starting with the trigger (down to 2 lbs. for me with a crisp trigger break), then built up a cheek support for my medium rings, and adjusted the hammer for more power. Right now the power is set for using Air Arms 25.4 gr giving me 918 fps with 47+ fpe. I cannot say enough about this gun. 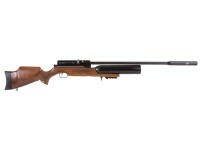 When I go to my sportsmans club range, I am asked constantly on the accuracy and power of this gun. I just show them the targets and wait for their amazement. I have rifles in 308, 22LR, 45-70, and 12 guage shotgun. This is by far my most fun, stealthy, and less expensive to shoot gun. You just gotta get one for yourself. Still more testing to come. 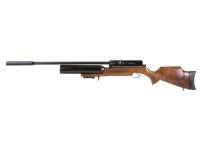 What 30 MM scope rings will work with this rifle? I have the Nova in .25 cal. I love the gun, my question is can I replace the aluminum bottle with a carbon fiber bottle to eliminate some weight? 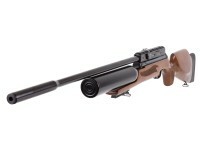 You could contact Hatsan.com and inquire , some of the new models have them. If there compatible or not? No. The .25 is tuned to use more air on every shot. 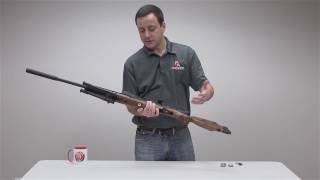 You will get less velocity and fpe on the .22. I'm sure you can tune the .22 to equals the .25's output but, maybe you'll have to replace the valve or even other mods.